Rodmaker Kathy Scott discusses her book The Letters to Everett Garrison, which opens the pages to his life through correspondence. Kathy and Dave Van Burgel return to the Catskill Fly Fishing Center & Museum for their popular rodmaking class Saturday August 31, through Thursday, September 5. The 2019 class is full, but it’s not too early to think about taking their September 2020 class. Watch the website for information. Learn about The Letters to Everett Garrison in this video filmed at the 2018 Catskill Rodmakers Gathering. Tom Morgan Rodsmiths will be teaching a week-long bamboo rod building class the week of Sept. 22, with an emphasis on using the Morgan Handmill. Participants will choose one of Tom’s tapers and learn hollow fluting, swelled butts, ferruling techniques, handle shaping, wrapping and go home at the end of the week with a finished rod. Class limited to 4 people. Makers showed off their rods, anglers practiced casting bamboo, and friends caught up with each other at the Catskill Cane Revival on Saturday, April 6. About 50 people gathered at Roscoe High School for the event, held in the gym as winter turns to spring and the weather warms. Click above to watch a video from the event. The Guild is starting a Catskill Kids on the Fly chapter that will meet at the Catskill Fly Fishing Center and Museum at 10 a.m. before the Guild’s regularly scheduled meetings. CFFCM celebrates with the 1st Annual Emerging Anglers Dinner at the historic Beaverkill Valley Inn. 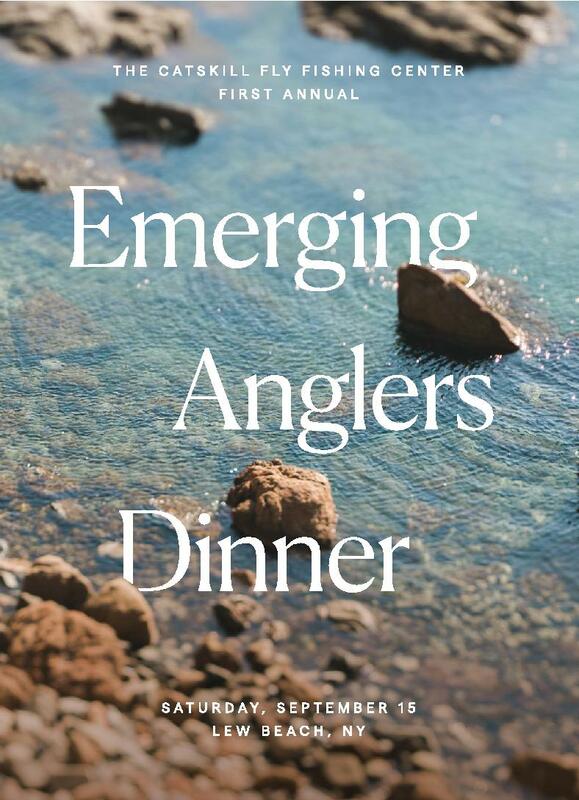 You are invited to join the CFFCM in a spirited night fueled by great food and fun intended to celebrate the youthful energy of the Catskills fly fishing community. There will be a multi-course plated dinner, an open bar with proud local spirits and brews, and DJ'd dance party post dinner. All proceeds are to benefit the Catskill Fly Fishing Center & Museum. Smart Attire requested. CFFCM member Dr. Gary Sherman has graciously donated a painting titled “Tarpon In The Mangroves” by William Goadby Lawrence to help benefit CFFCM. This 22” x 36” original oil on canvas, by a famed natural wildlife artist, is a stunning and magnificent piece of artwork. Lawrence is widely recognized as one of the greatest fish painters of all time. If you are interested in seeing the piece, please stop in the gift shop where it is on display. The appraised value is $7,500.00 and appraisal documentation can be provided. Inquires regarding the piece can be made by calling or emailing the office and all proceeds will benefit CFFCM. Please click here to be redirected to Volume 14, Issue 5 of the Castabout. LIVINGSTON MANOR – The Catskill Fly Fishing Center and Museum (CFFCM) will recognize three fly fishing individuals from the area as “Catskill Legends” during a ceremony at The Arnold House in Shandelee on Saturday, April 7, 2018. The 2018 “Catskill Legends” are Kris Lee, Ed Ostapczuk and Jack Yelle. “Catskill Legends” are the fly fishing pioneers who discovered and appreciated the richness of the rivers and streams in the Catskills. They receive a plaque stating: “In grateful appreciation for your contributions to the life and traditions of fly fishing in the Catskills, we recognize you as a Catskill Legend.” Since 2014, only twelve individuals have been honored a “Catskill Legends”. Kris Lee was born in Schenectady, NY and worked as an administrator at Elis Hospital in the hematology department. Kris had a love of the outdoors and had a photogenic eye to share the natural world with others. She was the principle person behind the lens for many angling articles written by her husband, Art. Together, they traveled the world and Kris documented their angling adventures. The beauty of the Catskills and other areas that were well documented in the many featured photographs in The Fly Fisherman magazine were photographed by Kris. She was one of the first incorporators of the Center. Her attention to detail and capturing many angling moments is what makes Kris Lee a Catskill Legend. Ed Ostapczuk, or Esopus Ed, or Eddie O, has been fishing the fabled Catskill waters for over 40 years. His intuitive knowledge of the local area is resounding, his passion for angling and conservation are ingrained in his spirit and he can often be found writing and speaking on these topics. Ed is a N.Y. licensed guide, published author and conservation advocate. He has also received multiple awards including the Trout Unlimited National award in Conservation and the Theodore Gordon Flyfishers Salmo Award. Ed continues to teach and enrich those around him through his written words on fly tying, fly fishing and cold water conservation and because of this, Ed is a Catskill Legend. Jack Yelle was born in Brooklyn in 1934. He could find beauty anywhere and often said, “There is never a wrong sky.” Jack and his wife Pat discovered Roscoe, NY in the early 1980s as part of their lifelong enthusiasm for nature and camping. It was here he discovered the streams, meadows, waterfalls, canoes, trees and barns that would dominate his art for the rest of his life. Upon his retirement, Jack and Pat moved to Roscoe to make it their permanent home where they operated Morning Star Creations, an art studio and gallery. From here, he began a 30+ year, second career, as an artist, teacher and community volunteer. For this and his contributions to the preservation of the history, beauty and vibrancy of the Catskill spirit, we are honored to call him a Catskill Legend. The event reception and silent auction begin at 5:00 p.m. with dinner at 6:30 p.m. The recognition ceremony immediately follows dinner. Cost is $50 for CFFCM members, $60 for non-members. Reservations are required. For reservations, a complete list of Season Opener activities, or more information about fly fishing, call CFFCM at 845-439-4810 or go to www.cffcm.com. The Catskills Fly Fishing Museum is proud to present Volume 14, Issue 1 of Castabout. Please click here to read the latest edition of our esteemed newsletter.